As mentioned before, we wanted to replace the flooring in the living room and in our boy's room, since the smell was pretty awful in those particular rooms. No amount of cleaning or use of products helped, as we later discovered that dog wee had basically pooled on the underlay. So, the only way was really to get rid of the carpets (and underlay, of course!). Downstairs, we wanted laminate flooring, not only in the living, but in the hallway too and in our toddler's room a new carpet. 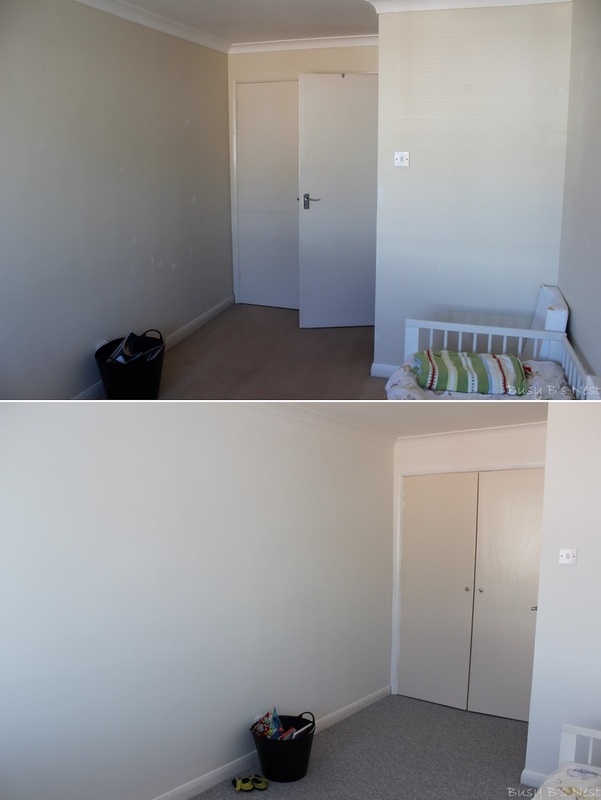 We tried to decorate all these areas before the floors were due to be replaced, but by the time we finished painting the living room, we realised we weren't going to have time to do it all, so we chose to decorate the bedroom and leave the hallway for a while. I thought cleaning paint from a carpet would be much harder that from laminate, should there be any accidents - which there probably would be (have I mentioned I have the clumsy gene?). Anyway, I plan to decorate my son's room, so that hopefully it's fun, but not too kiddy-ish. But, I haven't yet decided what colours and furnishings to go for and a consultation with the room's occupier proved fruitless. So, for now we're just blank-canvassing it with white (magnolia, be gone!). I started, as usual, by removing nails, screws, wall plugs and also the pelmet (hence the line above the window) and filling holes and cracks, including one long crack across the ceiling. Once all filled and bumpy areas were sanded, we got painting. We painted the ceiling, walls, radiator and woodwork (except the doors). The walls and ceiling needed about 3 coats for an even finish, but, the radiator only needed a couple of coats and the woodwork 1. All the doors upstairs will eventually be replaced, so I didn't waste any time painting these, although I plan to paint the front of the cupboard doors in my son's room in chalkboard black. I'm sure he'll enjoy drawing on them and they too can be replaced later if he wishes to do so. It's not a massive difference as the room was light anyway, but it feels (and smells!!!) 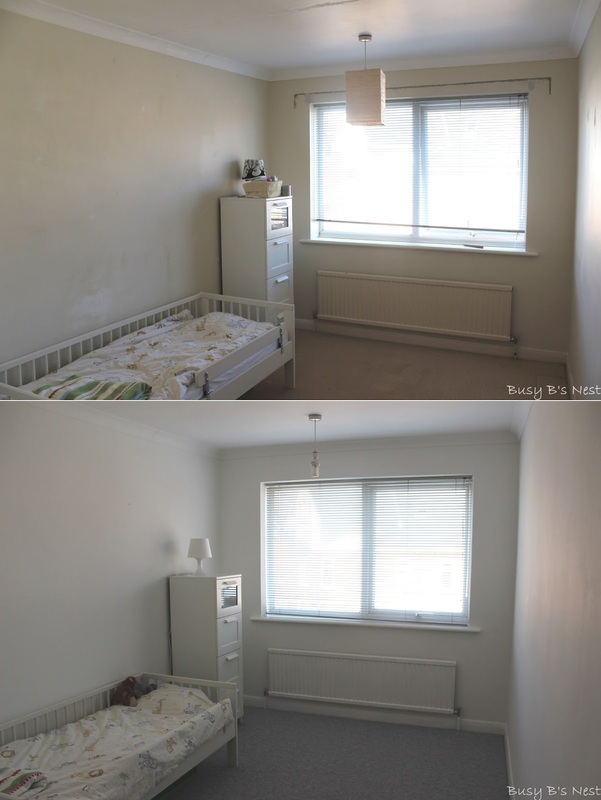 fresher and it's the perfect basis for making it (hopefully) a great boy's room for my son. 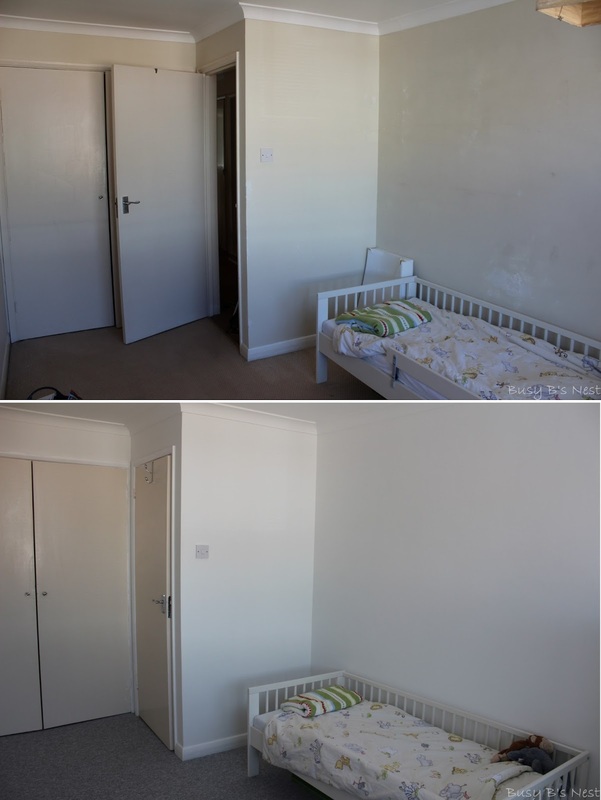 I can't wait to bring in some colour into this room and hopefully my son will like the end result!